Prepare yourself for another 13-hour stint at your true spiritual home: The Tote, with some bushy goodness thrown in. 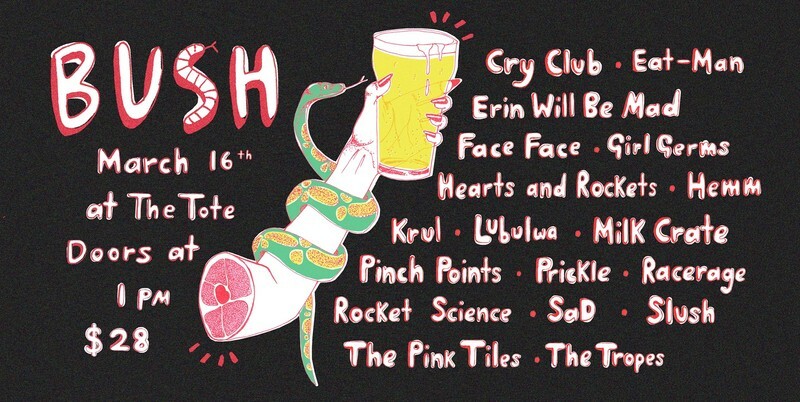 Bush Music Festival will be filling three stages with Melbourne's best and brightest for one (very long) day only. DJ playin' Bangaz until 2:30 for party times in the front bar. Bush Music Festival acknowledges that this event and all the work we do as musicians and organisers takes place on the stolen land of the Wurundjeri people of the Kulin Nation. No treaty has ever been signed and sovereignty has never been ceded. We pay our respects to elders past, present and emerging and thank them for their relentless work. We pledge to do better. The Tote is not a completely accessible venue however if you have concerns about accessing this event (financially, physically or otherwise) please contact us and we will find a solution that fits you. This is a zero tolerance space for sexual harassment, racism, sexism, homophobia, transphobia or any other form of bigotry. If you feel uncomfortable at any point please approach Bush or Tote staff. Poster design by Jasper Fearnley. Contact her for gig posters!